Hours after seven coaches of the Shaktipunj Express derailed early on Thursday morning in Uttar Pradesh’s Sonbhadra district, the engine and generator wagon of Delhi-bound Ranchi Rajdhani Express too went off tracks just a few kilometers before the train was scheduled to reach the New Delhi railway station. Fortunately, as in the case of the Shaktipunj Express mishap, no casualties were reported after the latest derailment. Railway officials said the driver of the Ranchi Rajdhani heard a cracking sound just as the train was changing tracks after which the engine and generator bogey were derailed. “We received information about the incident around 11:24 AM. The Delhi bound Ranchi Rajdhani was changing tracks to reach its scheduled platform at the New Delhi Railway station when its engine and generator van derailed. All passengers are safe and no casualties have been reported,” said Anshul Gupta, DRM, Northern Railways. An inquiry has been ordered into the incident. “It is too early to reach at any conclusion. An inquiry will ascertain the reason of the incident. Currently, our priority is to clear the line and restore it for functioning,” Gupta added. 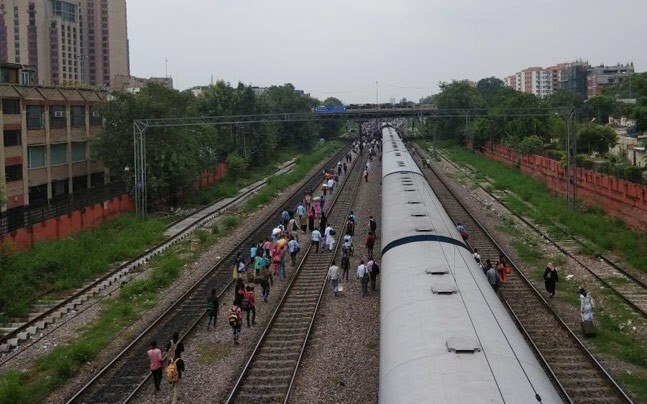 A number of senior railway officials reached the spot with rescue teams to clear the track, which is the main line to connect Delhi with the trains coming from the eastern part of India. “We felt a sudden jerk when the train was about to reach New Delhi railway station. The train stopped after the jerk. The railway officials told us that the engine and a bogey have been derailed. We got down at Shivaji Bridge and called a taxi,” said a passenger, Renu Singh. Earlier, at around 6.25 AM on Thursday morning, seven coaches of the Howrah-Jabalpur Shaktipunj Express had derailed in Uttar Pradesh’s Sonbhadra district. No one was injured in the accident and passengers were moved to remaining, undamaged coaches of the train and left the spot an hour after the mishap. The Ranchi Rajdhani derailment takes the number of such incidents to four within the past 30 days – and the second since Prime Minister Narendra Modi decided to appoint Piyush Goyal as the new Union railway minister. On August 19, 22 people had been killed and over 150 injured when 13 coaches of the Kalinga-Utkal Express derailed near Muzaffarnagar in UP. Days later – on August 23 – the Delhi-bound Kaifiyat Express collided with a dumper and went off tracks in UP’s Auraiya district, injuring over 100 people. On August 25, four coaches of local train in Mumbai had also derailed due to a technical fault injuring six passengers. The derailment of the Utkal Express and the Kaifiyat Express in quick succession had forced the resignation of then Railway Board chief AK Mittal and suspension of a few other senior officials while then Union railway minister Suresh Prabhu had also offered to resign taking moral responsibility of the accidents. While Mittal was replaced with Ashwani Lohani – who was then the chairman and managind director of Air India – Prabhu was moved from the railway portfolio to the commerce ministry on Sunday when Prime Minister Narendra Modi reshuffled his council of ministers, appointing Piyush Goyal as the new rail minister. However, on Thursday, despite two derailments happening within hours of each other, there was a studied silence from the top brass of the railway ministry with neither minister Goyal nor Railway Board chief Lohani issuing any statement on the mishap.